Being the human to two very dapper and fashion forward pooches, means that their wardrobe is getting even bigger than mine. 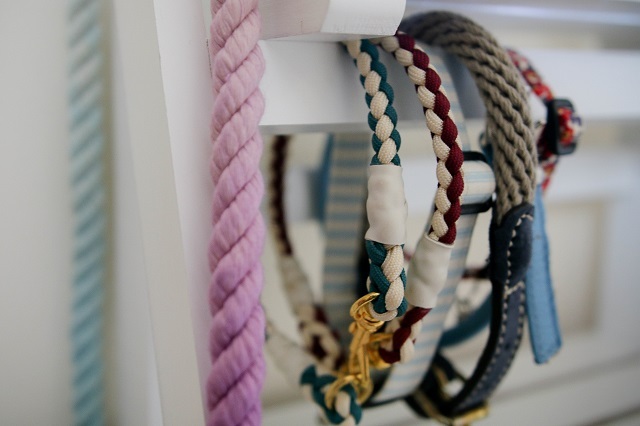 Dog wardrobe organisation is a must with all the leads, collars, bow ties and bandanas. Severus and Lily have it all. Now even if you aren't as crazy dog lady as I may be, with the amount of lovely dog shops out there, it's hard not to treat the pooch furry ones every now and again. Dog wardrobe organisation has come rather slowly, with bow ties in random pots and draws, leads hanging around the back door and the ever growing harnesses being thrown anywhere there is space. The "small room" has some what been taken over by photography equipment....and dog stuff! Meaning it was time to sort all that stuff out and get Sev and Lily's wardrobe looking ship shape and perfect. It still isn't finished, as I think another set of draws is still needed, but for now this little corner of the room is the perfect place to show case everything dog friendly in the fashion world. 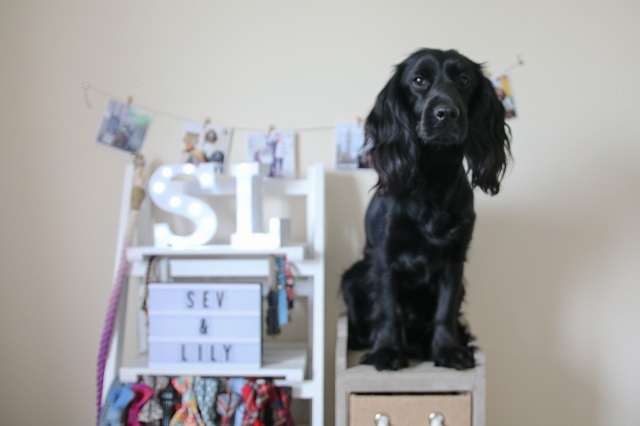 Wanting a mix of hanging space and draws was really important and something needed to make sure all the spaniels goodies were organised in the right way. The draws are perfect for the feel of our decor, as well as being big and deep enough to hold many bandanas and dog coats too. As well as the draws the ladder storage was the best find, being things can sit on it as well as hang on the rail. 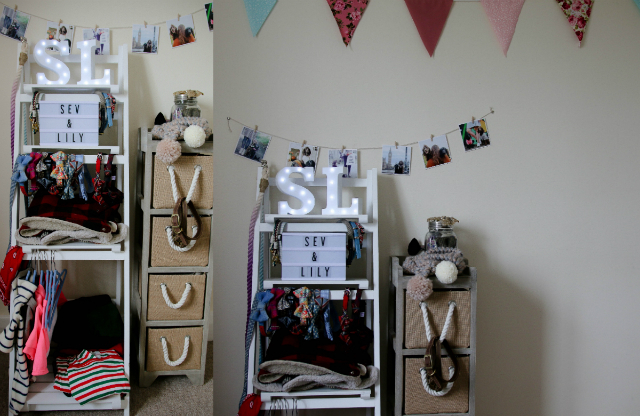 This bit was pretty simple, just filling the gorgeous storage with all the dogs clothes and accessories. Using the ladder to hang our collars, leads and also collar and bow tie combo's. Larger/thicker coats also sit on the steps nicely, as well as other jumpers and equafleeces, easy to grab as they are used a lot. 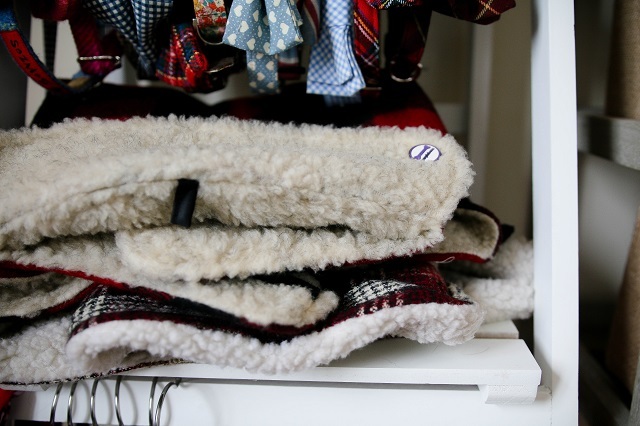 Other dog clothing items are hung at the bottom to keep everything as neat as possible. 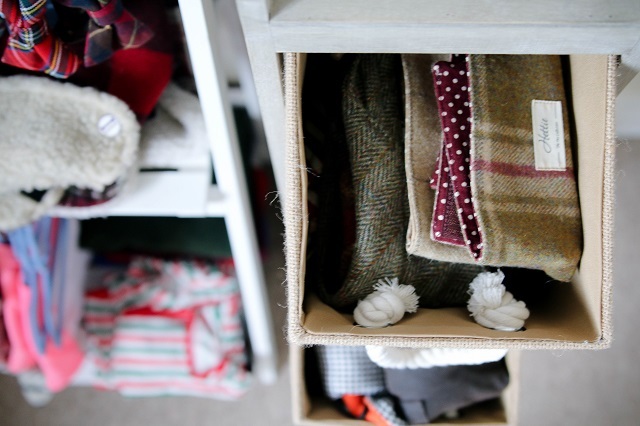 The draws are used for smaller coats, harnesses and neckerchiefs, all organised in each draw. There is also a draw for bits and bobs, and seasonal outfits, such as valentines day bow ties and halloween bandanas. As well as this the top of the draw unit is where all the bow ties are kept. 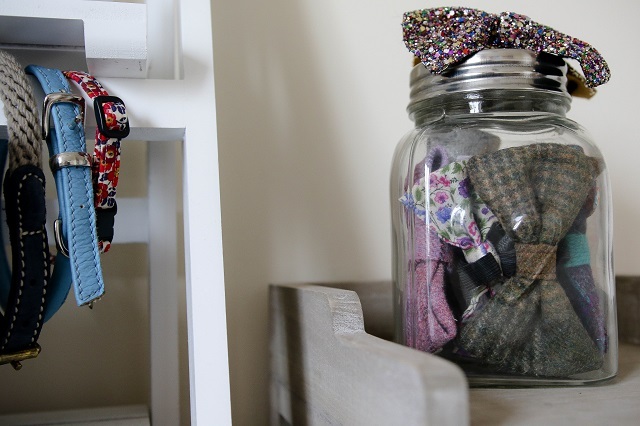 A rather large glass jar holds the dog bow ties, easy to pop in and out and pick what the dogs wear from day to day. The jar is getting a little full now....safe to say that bow ties are our favourite. 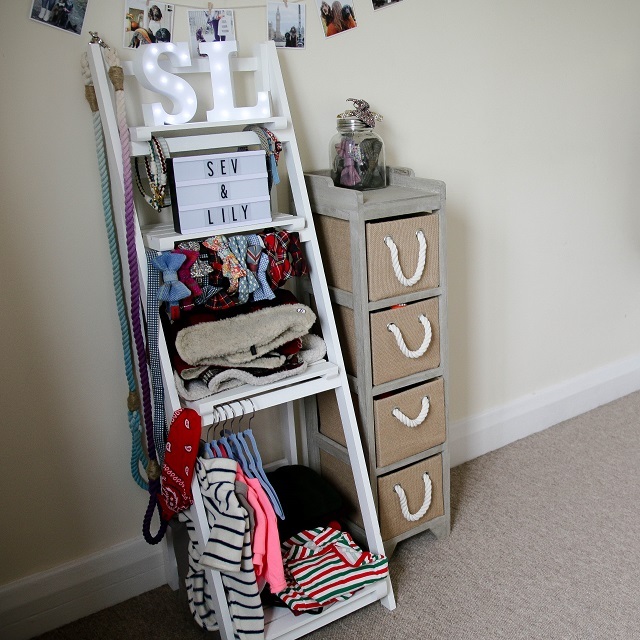 Buying both the draws and ladder storage from Matalan, however there are so many places that have reasonable interior storage. 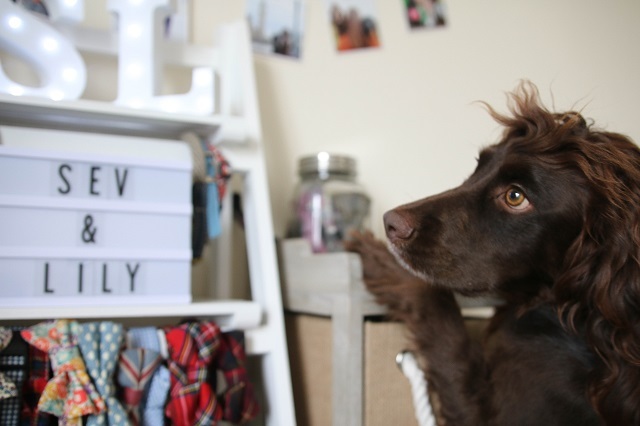 Argos, Dunelm and Asda are other places to try when you're looking for the perfect dog wardrobe organisation. The small hangers are also from Matalan, they are just child size, however they don't sit perfectly and we're still looking for an alternative. Finally the sweet glass heart jar is from Home Bargains, another great place to find sweet and unique storage, as well as being totally affordable too.